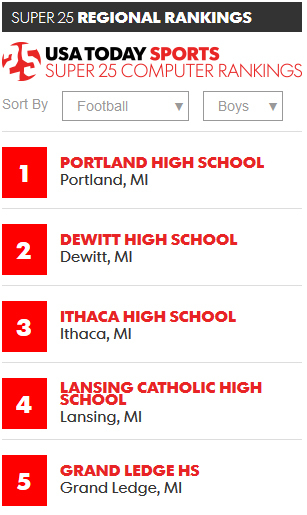 These are the top 5 football teams in the area. Is one of them your team? Your opponent? Get ready for a great game! Its getting toward the end of October and while the little kids are thinking about Halloween costumes and loading up on mini Kit-Kat and Snickers Bars (okay, yum that does sound good) the older kids are loading up on team spirit and getting behind their respective Varsity Football programs as the playoffs for State Football Champion kick off this weekend. Did your team not make the playoffs? Bummer. A lot of kids put their heart and soul into their season and still came up short. But thats part of the glory and rush of the playoffs. Survive and advance! There are hot first round playoff games all over the region this weekend. Maybe at your local high school, and maybe you&apos;re traveling into enemy territory. No matter where the game is played, get out and support your local teams because I truly believe, prep sports is at the heart of all the best in sports. Community pride, team-building, goal-setting and physical conditioning - all traits that make our young people stronger. Here&apos;s where to go to see where your team plays this weekend and what time. Who will advance this weekend? Will there be any big upsets? Who is the Cinderella school with something to prove? Who&apos;s got spirit? We all do - now get out there and show it!